It's been a year and a half since Bully (Canis Canem Edit in the UK) built up a storm of controversy and then sort of fizzled out of the public eye, but Rockstar Games has refused to let the game die quietly. 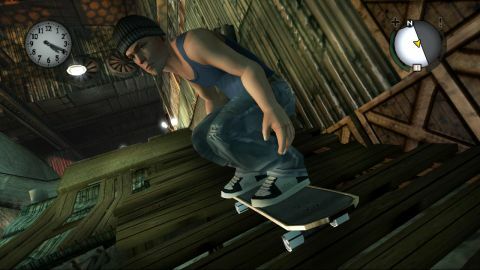 Instead, Jimmy Hopkins and crew are getting a second chance at life in Bully: Scholarship Edition, a remastered and expanded version that adds updated visuals and a slate of new missions and classes to the already excellent story and gameplay of the original. And if you missed it the first time, now's your chance to catch up. Like the original, Bully: SE mixes free-form, Grand Theft Auto-style exploration with childish pranks and bare-knuckle violence, creating a high-school-delinquent experience that's surprisingly charming underneath all the snot-nosed rebellion. As sawed-off little tough guy Jimmy Hopkins, your goal is to survive a year at Bullworth Academy, a boarding school that's home to elite snobs and roving packs of delinquents who - like Jimmy - wouldn't be accepted anywhere else. Luckily for us, Jimmy's not satisfied with mere survival, and the longer he spends at Bullworth, the more fed up he gets with its culture of bullying and idiotic power struggles between the school's five cliques. It isn't long before he decides to take matters into his own hands, first trying to fit in with each of the cliques and - when that doesn't work - savagely pummeling them until they recognize him as their leader. It helps that, in addition to slowly getting access to a small arsenal of stink bombs, firecrackers and other improvised weapons, Jimmy's strong enough to beat up an entire football team at once. Which he'll have to, because until he earns respect from the cliques, they'll frequently attack him with little to no provocation. Not that they'll get in any more trouble than he will; the game's cops, prefects, teachers and other authority figures seem to be keeping an eye on Jimmy specifically, and if they catch him fighting - or playing pranks, bullying other students or, horror of horrors, hitting a girl - they'll chase him down and attempt to haul him off for detention unless he can get away. Of course, there's a lot more to Bully than just violence. There's also vandalism, bike races and the dozens of errands you'll have to run while on missions for the teachers and students at Bullworth. The world - made up of Bullworth Academy and the big, diverse town that surrounds it - is small but intimate, and there are constantly new things to do as new areas and missions open up. Suffice it to say there's a huge variety of stuff to do, ranging from covert photography, graffiti and egging houses to making out with girls (or certain boys) or just cruising around on Jimmy's always-accessible skateboard. There's also a bunch of new stuff that's been added for Scholarship Edition, not the least of which is a new series of missions revolving around Christmas. Whereas before, Jimmy would just be called down to the headmaster's office to receive a depressing sweater from his hateful mother, there's now a whole new sub-plot involving a war between a drunken hobo Santa and a more legitimate-seeming "impostor" who's "stealing his money." There's also a ridiculously humiliating Christmas pageant that makes the sweater thing seem trivial and non-traumatic by comparison. Description Take the tough kids down a notch and rule the school with an iron Wii Remote, as thuggish protector of the weak Jimmy Hopkins.